We are celebrating summer and July 4th in our Sunday Supper group this week with things to take on a picnic, to the beach, your favorite neighborhood BBQ or simply to enjoy at home. I have wanted to make this dessert for a while and decided to try my hand at a homemade version that would have less refined sugar and made from homemade ingredients. I recently bought beef gelatin and set out to make several things. I first made my own jello. 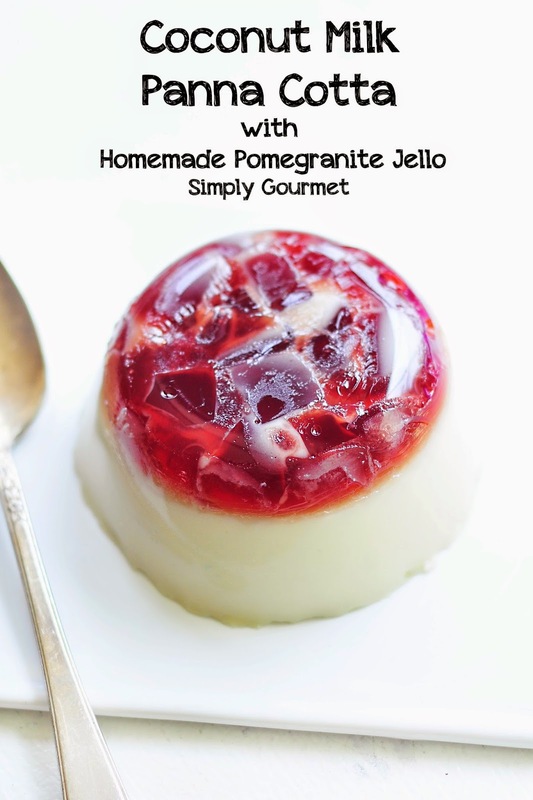 The red jello you see is made with three simple ingredients: unsweetened pomegranate juice, raw honey and beef gelatin. It was really easy! I have included the recipe down below. The second thing I wanted to make was panna cotta. I love the smooth, yet set, feel of this dessert. My only concern was the dairy. We are trying to cut back and so I wondered if I could use coconut milk. I discovered that you can and it works like a charm. 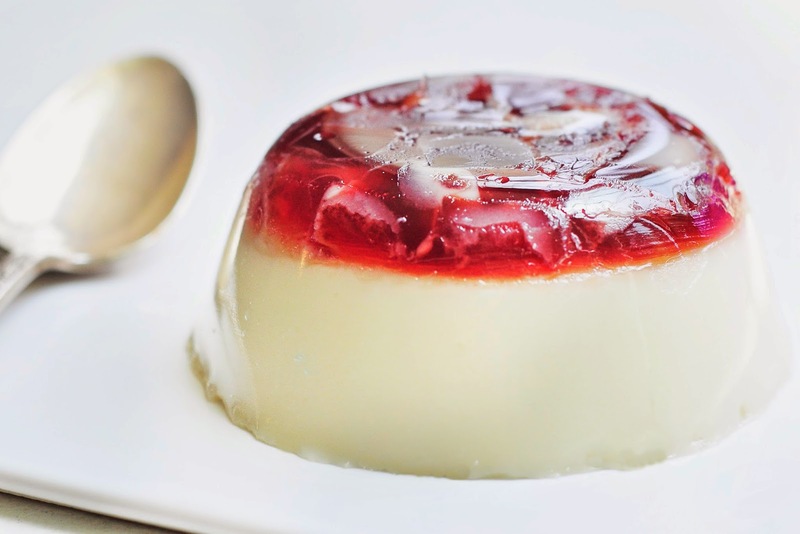 I added a bit more beef gelatin to the recipe to make it more "jello-like" so it is firmer than a regular panna cotta. Recipe is also shared below. So--you basically get three recipes for the price of one! A funny side note about the panna cotta. I have a schedule each day. The schedule is centered around nap times. If you have kids and work from home you might relate to this issue too. When nap times happen I know that I have exactly 92 1/2 minutes and 39 seconds (roughly speaking, of course) to get about 4 hours of work done. It is a race in my kitchen of grabbing, cooking, slicing, picture taking, cooking, washing--yeah, I am sure you are starting to get the picture--so imagine my complete and udder frustration when I have to deal with a malfunctioning piece of ---- (won't say that out loud). My husband, for 26 years, has held his tongue about owning an electric can-opener. I cannot stand these things and have forbidden the purchase of one. Well, I caved a month ago. If he wants one, then fine--buy one. It has worked okay. Not great but I have suffered through it. I even put my hand-held can opener out into our trailer (by the way, that is a pop up and the kitchen is not close to the door). Rye had a follow-up appointment with her oral surgeon and Cory drove so that during nap time I could make this dessert. Everything was fine and on schedule until it came time to make the panna cotta. Two cans of full fat coconut milk are needed and outside of gnawing the tops off I had to use the electric can opener. I mentally prepared myself and hoped for the best. Well, I fought with that dang thing for 30 minutes trying to get it to work. I won't repeat the thoughts that were going through my mind but it involved the use of my windows and possibly a huge sledge hammer. I am trying to be zen like and not get too excited about little things like this and so I decide its not worth it and get my knife and hammer out. DO NOT DO THIS AT HOME--unless you are desperate and need to work while your baby is asleep. To make a long story short, I got the cans open, made the panna cotta and made my husband stop by the store for a manual can opener on his way home. I think that peace will once again return to the Watson home. You will notice that I have included two pictures that are not stained glass. This is how I used any of the leftover ingredients. I made individual portions to see how it would work. I loved that they slipped out of the little pyrex bowl and made these cute little desserts. Next time I will serve them with some berries and whipped cream. Isabella thought they were really fun to play with and slurp. 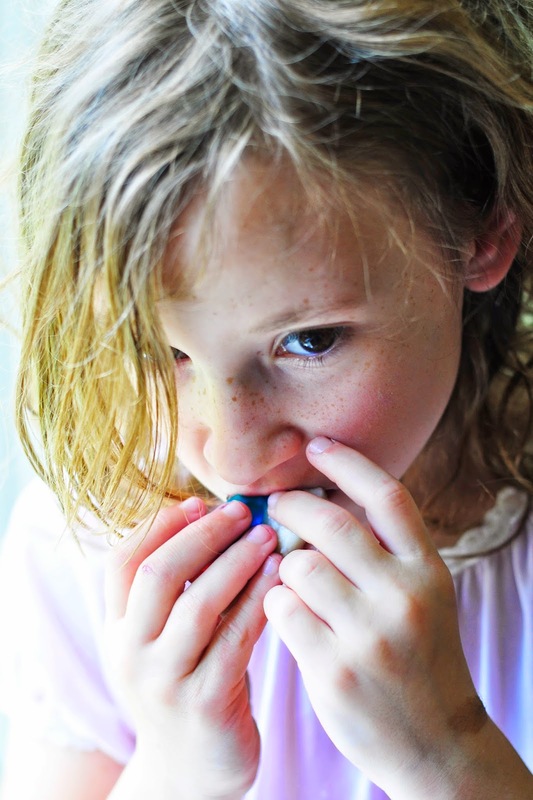 Do you remember slurping Jello as a kid? 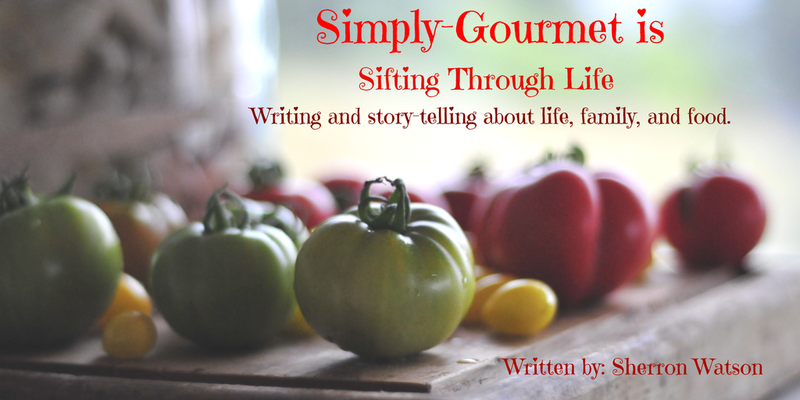 Please visit my fellow Sunday Supper contributors to learn, discover and find a few more delicious recipes for your summer fun. 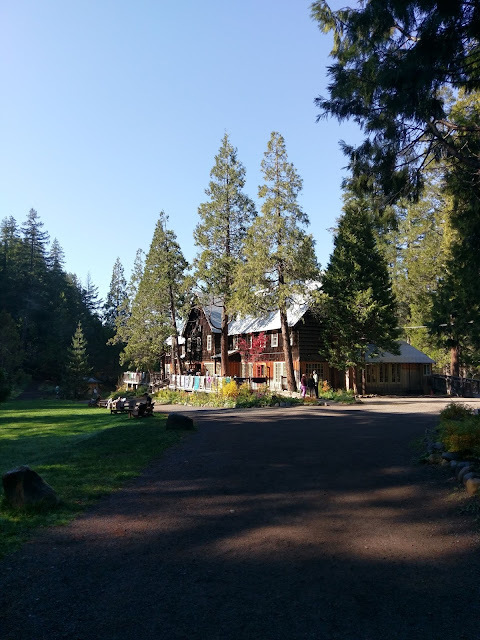 Links are at the end of this post. 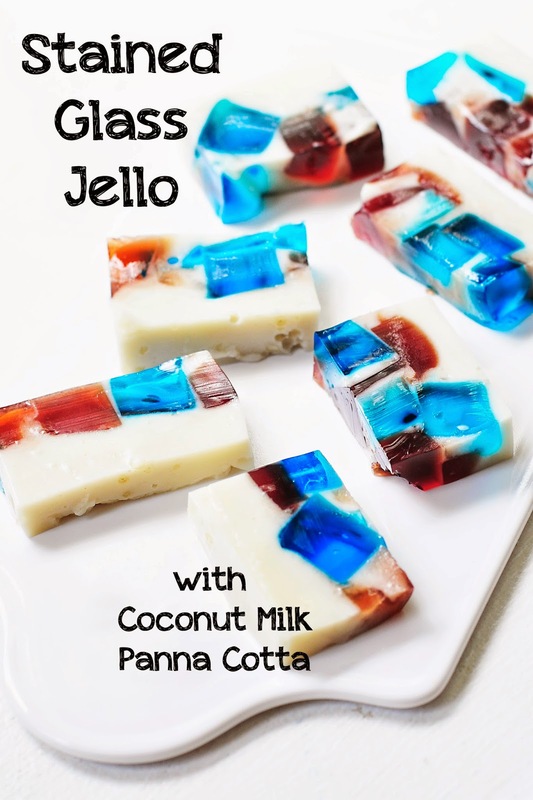 NOTE: I used a store bought Jello box because I could not find any true blue juice at my grocery store and in order to do a red, white and blue theme--I had to use this product. 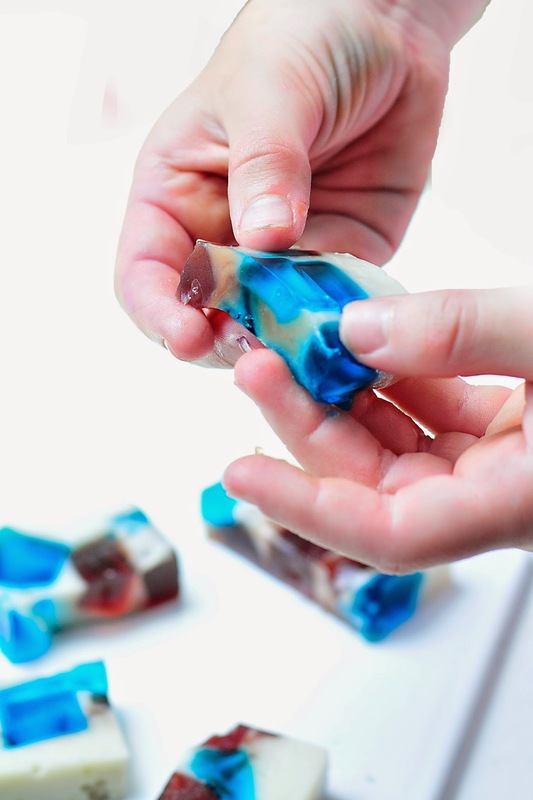 You can also make this using any color gelatin and name it "Broken Glass" or "Sea Glass". 1. 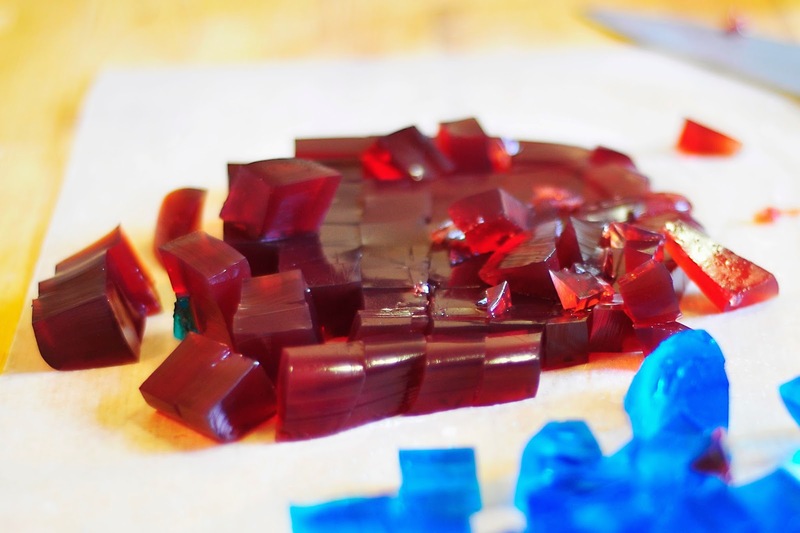 Take prepared Jello's and dice them into small pieces with a sharp knife. Mine ranged in size from a half inch to smaller. 2. 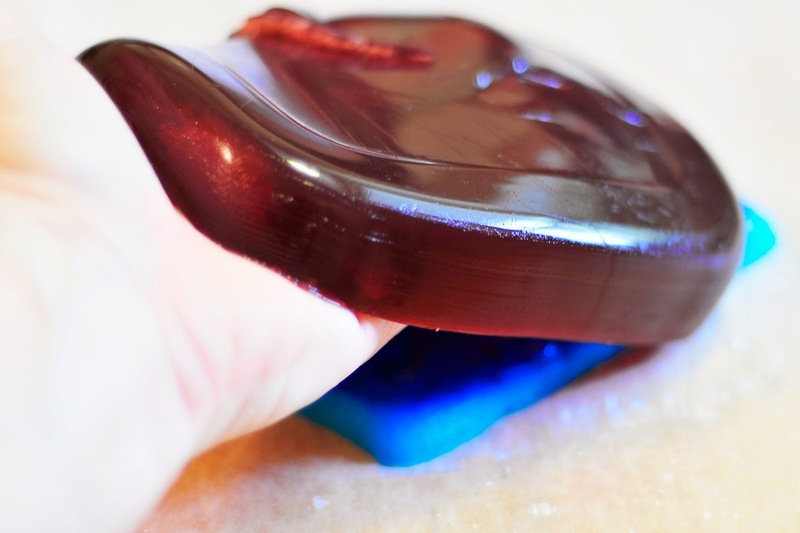 Place all of the blue and red jello pieces in the bottom of a baking dish. If you use a larger or smaller version than what is recommended your dessert will be either thinner or thicker. 3. 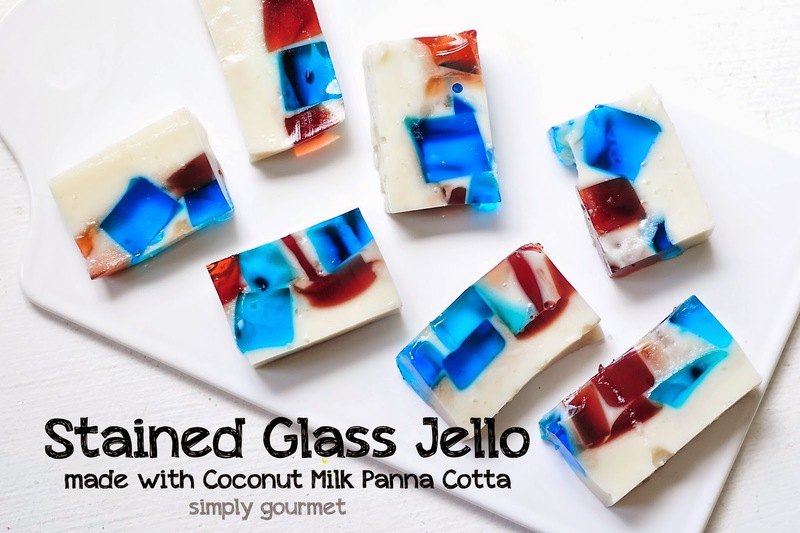 Prepare the coconut milk panna cotta and pour over the red and blue pieces. Cover with plastic wrap and refrigerate until solid. About 2-3 hours depending on refrigerator. 4. When set, remove from refrigerator and slice to serve. I sliced mine into bite size rectangles. They can be cut using your favorite cookie cutter too. 5. Store left overs in an air tight container and refrigerate. 1 cup of unsweetened juice. I used pomegranate to get the red. 1. Add juice and gelatin to a small sauce pan. Let sit for 5 minutes. The gelatin needs time to soften and expand. 2. Place sauce pan on medium heat and warm. DO NOT BOIL! Boiling will ruin the gelatin. 3. Once the juice is warm. Remove from heat and add honey. Stir until combined. 4. Add juice-gelatin mixture to a small bowl. My bowl was square 4X4. 5. Let set in refrigerator. At least an hour. NOTE: A traditional panna cotta is served with berries or has berries in it. I used the red and blue jello in place of this in the pictures above. This panna cotta will set very firm. To make it softer but still set, use 2 tablespoons of gelatin instead of 3. 1. In a medium sauce pan add one can (1.5 cups) of coconut milk and gelatin. Let sit for 10 minutes. 2. Place sauce pan on medium heat and warm coconut milk. DO NOT BOIL. When steamy, remove from heat and add remaining ingredients. 3. Let cool slightly--if you don't do this part--then you will see some of the jello bleed into the dessert. This did not bother me but you may think differently. I suggest wait about 10 minutes. If you are not adding it to a dish full of jello pieces, then go ahead and add to your serving dishes (large or small) and wrap with saran wrap. 4. Let set for 3 hours. Serve with berries and whipped cream. LOOKIE HERE---LOTS OF DELICIOUS PICNIC RECIPES! Are you looking for picnic recipes? Look no further than this fabulous list by Sunday Supper contributors. It is everything you need for a scrumptious day in the great outdoors. I nominate you for most beautiful, artistic dessert of the week! This is like abstract art! I adore it. Those are so pretty, Sherron! I don't have an electric opener but I have experienced opener malfunctions and I just wanted to throw that dang thing out the window. I'm glad you were able to get the cans open in time to make your beautiful desserts. Wow. stunning, delicious, clever and I love the use of the coconut milk too. I second the nomination Dorothy. I have always wanted to make these but haven't then you upped it with the panna cotta!! LOVE the stained glass jello...so beautiful AND festive!!! This is so very cool looking! 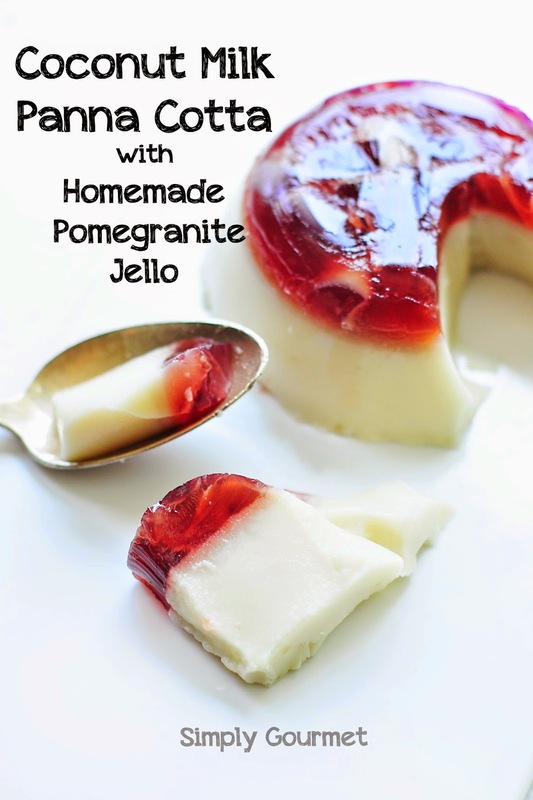 I was ready to cringe because of all those 70's monstrosities that flew through my head when I thought of jello, but I'd totally make this! Very fun. This isn't dessert it is a work of art. GORGEOUS! Can you explain the difference between beef gelatin and unflavored gelatin. Can the beef be substituted with any other gelatin? Hello---Sorry it has taken me a few hours to get back to you. Sundays are busy around the house with lots of people going in lots of directions. To be honest, I don't think there is a difference. I chose to use Great Lakes Beef Gelatin because of its history with how they raise their animals and produce their products. This company is very open with the ins and outs of how they make their product. I found this site with some great information about The Great Lakes brand and why she chooses to use the product (much for the same reason that we do). The link is: http://butterbeliever.com/choosing-gelatin-powder/ I hope this helps answer your question. Have a great day. Oh my goodness, these are beautiful! I wouldn't want to eat them. Well, almost wouldn't want to! This is so pretty! I love how you made the red jello! great idea! What a gorgeous dessert! So very pretty!